Barnyard Weed Warriors is first and foremost, a goat grazing service, offering weed, brush, invasive trees and wildfire prevention. 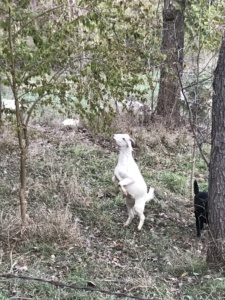 We bring our goats to your property to eat their way through the vegetation, lowering the amount of biomass on the property and lowering the chances of fire intensity. We are not a one-time fix, but rather a way to manage your land in a manner in which benefits the land in many ways. In addition to vegetation control, BWW can also provide working dog demonstrations, educational programs, entertainment, and help raise money for special causes. We are also available for baby goat therapy, in the early spring. Ash Grove Goat Ranch, the home of the Barnyard Weed Warriors is also open to guests from February through May and also offers an August Star gazing with the Goats activity, during the meteor showers. Call for more information if you would like to visit the ranch. Working dog demonstrations– BWW is often asked to do working dog demonstrations for special events. We bring ten to fifteen goats and the dogs, to ‘work’ and demonstrate the way the dogs can herd livestock and we can also do an education program about the goats as well. Educational programs– BWW is all about educating the public about the benefits of using goats as an all-natural way to manage land, without chemical controls and the health benefits of goat meat. We also like to educate the public on animal agriculture and often hosts visits from home schooling groups and private individuals. We welcome groups to our farm and we can also come to a site, to educate as well. Benefits– BWW is willing to schedule work, to help raise money for various benefits. Do you have a library project that needs a special activity to draw people to your event? Let the goats demonstrate their weed eating abilities for the public. Therapy– There is a therapeutic value, to watching goats do their thing with the vegetation. People admit being mesmerized by the goats working as a group, to eat the vegetation. Many times visitors find themselves relaxing and enjoying the simplicity of the activity AND who can resist a goat? We offer specific types of therapy, including baby goat therapy, which is an on-ranch activity in the early spring. Coming to watch the babies play or holding a bottle baby can often erase the weight on your shoulders. Sometimes the simplest things in life are the best thing to turn your bad day into something sweet. You can call and schedule an appointment. Star gazing with the goats- This activity is generally for the month of August, during the meteor showers, however, the view of the night sky from our ranch is something to behold. We have no city lights to interfere with the view and our sunrises and sunsets are also great photo opportunities. We offer primitive camping in the horse pasture and you can also set up your RV with no electricity in the pasture. Come and see the goats before the sun goes down and then set up your telescopes and cameras for the night sky viewing. Consultation Services- Consultation Services include helping those interested in starting their own goat herds or goat rental business and land management with goats. Mary can educate individuals on goat management, health, nutrition and setting up your own goat rental business. Special one-on-one clinics can be scheduled during the winter season, for those wanting to work out a plan to manage their land with goats. Please contact us for more information and scheduling.